Mystery Mark--Cup(?) in circle with J(?). S. A. A. 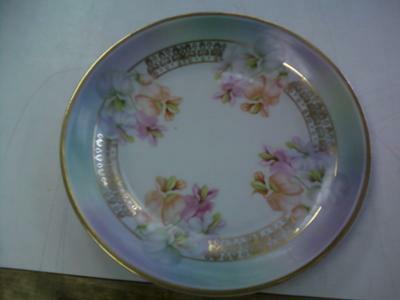 My mother just bought this lovely china plate at a local thrift store. I have been searching the internet fruitlessly for hours trying to figure out the mark. The picture of the mark isn't very clear (apologies, camera phone), but it is what looks to me like a cup or chalice in a circle. 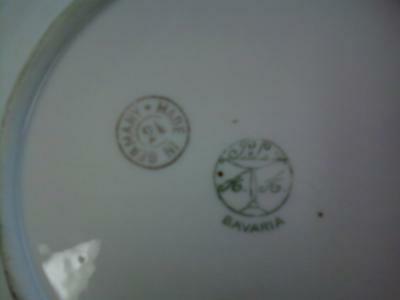 There are two letters on the cup's rim, the first could be an ornate J or P, the second is an S. On either side of the cup's stem is the letter A. Underneath the circle is "Bavaria" and there is a "Made in Germany" mark as well, right next to the marker's mark. I will be ever so grateful to any light that can be shed upon this subject. Comments for Mystery Mark--Cup(?) in circle with J(?). S. A. A.
Dear Rose, The center green mark with BAVARIA underneath is the mark of Schonwald Porcelain Factory of Arzberg, Bavaria, Germany. The company has been in business from 1890 to the present but Kovel's book of marks states that your mark was used from 1920-1927. I'm not sure of the reason for the second mark but the two most likely possibilities are that the company changed marks while your plate was in stock storage as an undecorated blank and they added the second mark or the first mark when it was decorated or that the second mark is that of an outside decorating company that added the mark when they decorated the blank plate which they had purchased from Schonwald. The 21 or 24 in the center of the second mark leads me to believe it was decorated in 1921 or 1924. An outside possibility is that the 21 or 24 represents a pattern number but that seems to me a longshot. Thank you so much! I thought it would be weeks before I heard anything. And thank you for including such detail, it is a great help. Thank you again.